Enjoy very low commissions and extremely low margin rates while trading in the language and currency of your choice. Place Trade's state of the art trading platforms are available in English, French, German, Japanese, Chinese (both Traditional and Simplified Chinese) as well as Spanish. State of the art trading platforms are available in English, Français, Deutsch, 日本語, 中文, Español& more. Call us at 919-719-7200 for more Market Center Details on products traded, order types available, and exchange website information. Japanese stocks to Japanese residents. ** Creation, redemption and physical delivery of exchange-traded commodities ("ETCs") is not supported. Hong Kong Futures Exchange (HKFE) Options (Equity Index) 09:00- 16:00 HKT. Derivatives trading hours vary. Securities options are defined as any option on an individual stock, US legal stock, or any cash-settled broad-based index future. US legal residents are generally excluded from trading securities options outside of the United States due to SEC restrictions. It should be noted that cash-settled options outside of the US and Canada are included in the commodities account in order to provide a cross-margin benefit with futures. Hong Kong Futures Exchange (HKFE) ETFs 09:00- 16:00 HKT. Derivatives trading hours vary. Hong Kong Futures Exchange (HKFE) Warrants 09:00- 16:00 HKT. Derivatives trading hours vary. Hong Kong Futures Exchange (HKFE) Structured Products (CBBC) 09:00- 16:00 HKT. Derivatives trading hours vary. Hong Kong Stock Exchange (HKFE) Indices 09:00- 16:00 HKT. Derivatives trading hours vary. Bond quotes are not firm and order minimums can vary. Some TradeWeb and Knight BondPoint quotes may have a minimum size requirement that is not displayed. These factors can make smaller trades (<100k) extremely difficult to execute, and may preclude your order from being executed. Bonds with face value over USD 1,000,000 may be direct routed to BONDLARGE. All other bond orders are eligible only for Smart routing. Buy side RFQs are not supported at ValuBond or MuniCenter. *If our minimum commission per order is less than our clearing firm's minimum, then you will be charged the clearing firm's minimum commission. Trade stocks, ETFs, options, warrants, index, indices, equity index, CBBCs, Callable Bull Bear Contracts, Indices Options (Equity, Equity Index) and more. 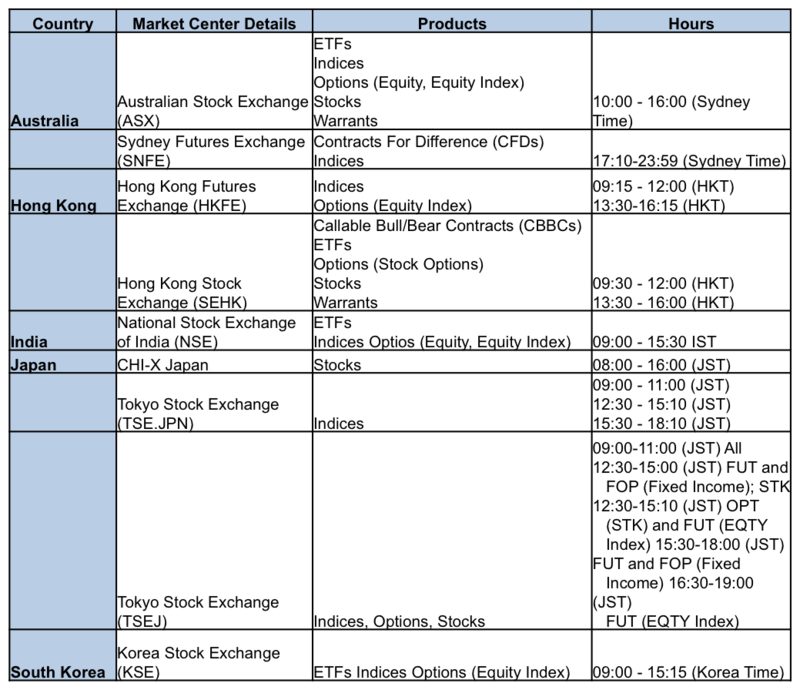 Global Exchanges / Market centers include Australia, ASX, Hong Kong, HKFE, SEHK, NSE, Japan, CHI-X, TSE.JPN, TSEJ, Korea, KSE.